After our miscarriage I truly didn't know when or if this day would ever arrive. That may sound dramatic to some of you, but its true. Getting pregnant again could've gone either way, and as much as people say you will be fine and get pregnant again, one of the biggest fears after miscarriage is that there is something wrong with you. Being pregnant also holds no guarantees and coming this far feels like a little extra celebration should be in order! Every day, week or month is a milestone. So to me, this day came as I hoped it one day would and I couldn't help but sing praises to the Lord for a day that we got to celebrate this growing human life, Juniper Rae. A life that is being sustained, that is being prayed over and loved on, one that is intricately designed and formed by our amazing creator. Baby showers are such special days, and for me it was truly about celebrating as much as I can... celebrating and valuing life by setting aside time to gather, break bread together and enjoy the company of growing relationships that this baby will soon be apart of. It is day to sit with the people we love and fully express our joy for the arrival of our child. I thought about this day a lot before I got pregnant again and it truly exceeded every expectation in every way possible. We feel so blessed and overwhelmed by the love shown to us through our whole journey of becoming parents from our miscarriage to now and we can't thank the people in our lives enough for making this day so special as well as seeing us through it all. It's so evident how much Juniper is already loved beyond measure and that honestly melts my heart (as cheesy as that sounds). So needless to say, this day couldn't have been more perfect. 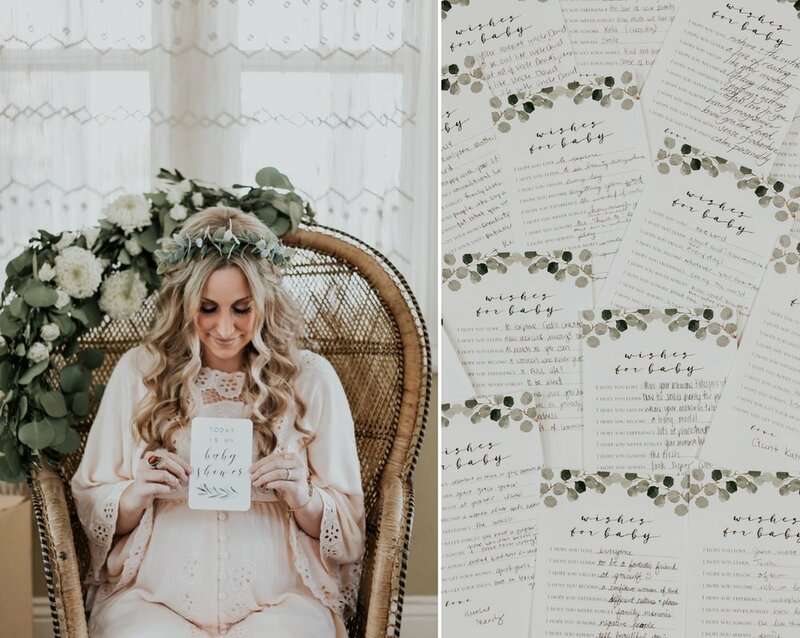 Our friends, family and Juniper are of course the most important aspect of this baby shower but it was made that much more memorable to get to plan and put together everything for this occasion. 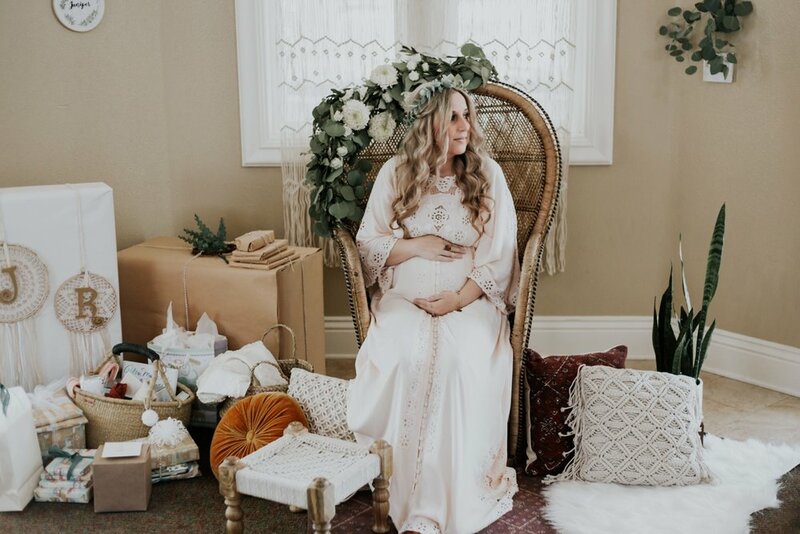 I'm so excited to share with you all the details of my baby shower because it was so fun dreaming up this day for our little Juni. 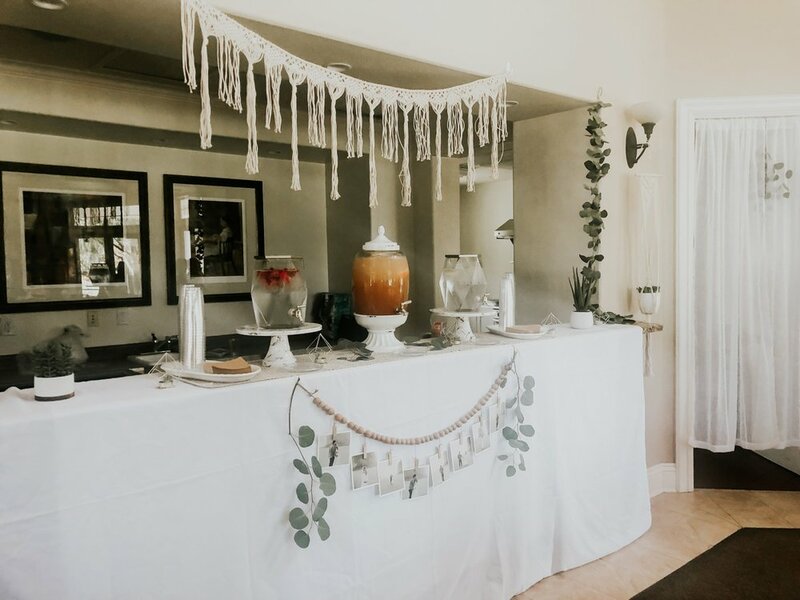 My mom is the most beautifully creative minded person and the fact that she threw the modern boho shower of my dreams just made the day even more special. She truly brought my vision to life in every aspect and added touches that were one of a kind, sentimental, sweet and just downright beautiful! She made this day a dream and I still am looking back on it as something that I will cherish forever! Of course whenever there is a shower I look forward to the food (who doesn't)! With a light lunch full of a variety of fresh salads, sandwiches, bread with spreads and a cheese board with nuts and fruit, it made for a great meal. Not to mention my mom's infamous "mocktail" punch that is always a hit! For those who know me, know I love to bake! It felt fitting to get to bake some goodies for the shower so I made my favorite raspberry shortbread cookies and also made strawberry white chocolate pyramids with some gold touches! We of course had to have donuts also and my mom made mini lemon olive oil bundt cakes from scratch and individually wrapped them for people to take home! 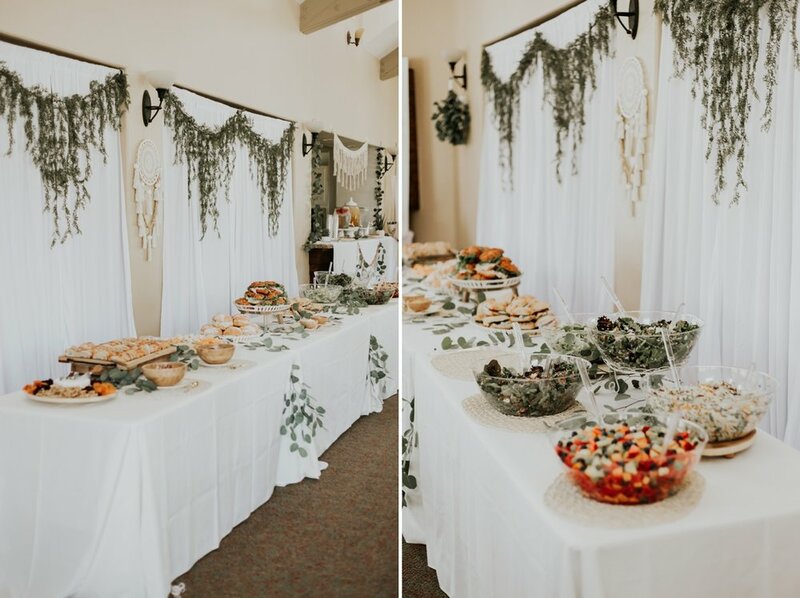 I was truly inspired to have the tiered dessert platters as the table centerpieces after coming home from England. 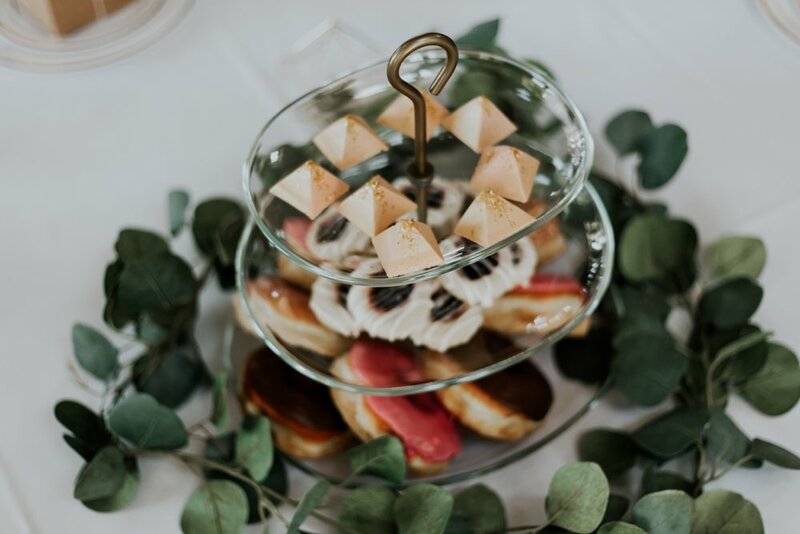 I loved their afternoon tea time and so having the desserts as a part of the table setting was so fun and made for a beautiful yet delicious treat! 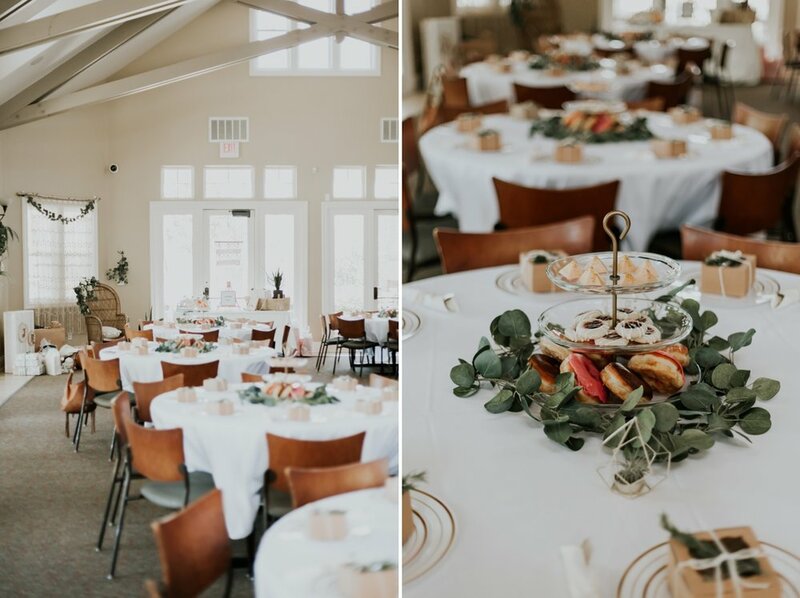 Adding touches of white and gold plates, gold cutlery wrapped in napkins and crochet ribbon, gold geometric votives full of air plants and eucalyptus greenery around the desserts made for such pretty details. 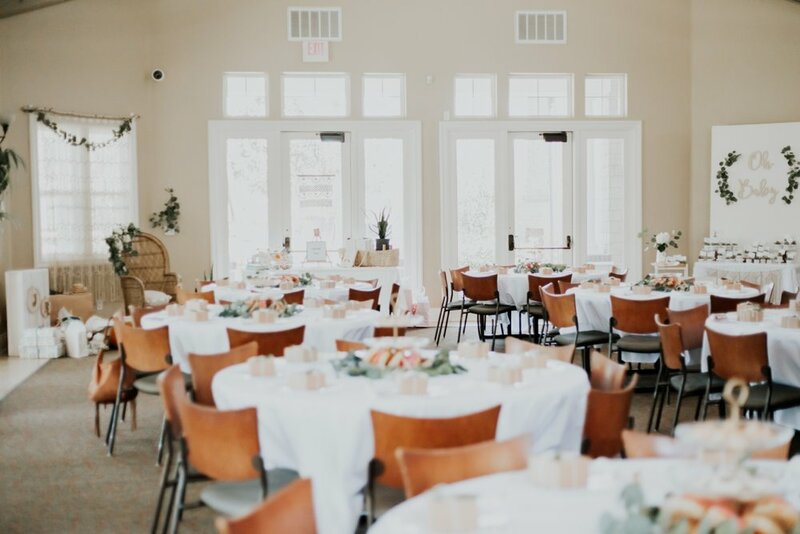 Upon arrival our guests gathered at the guest table where touches of bohemian pieces and earthy tones came together with live plants and greenery and guests were able to give their parenting advice and enter into the diaper raffle. Personal touches included some photos of Dan and I from our first trimester and our recent trip to Portland, OR. 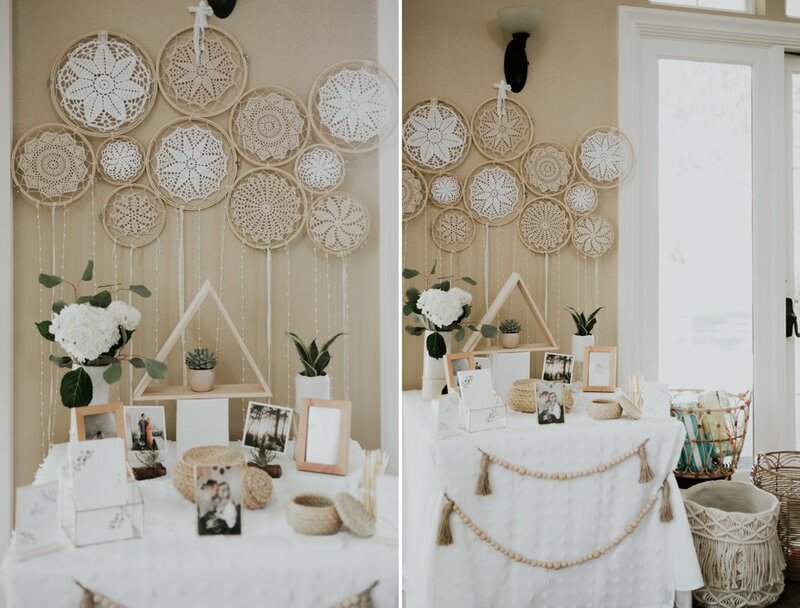 My favorite decoration from the guest table was the backdrop piece which really added a lot to tie it all together. 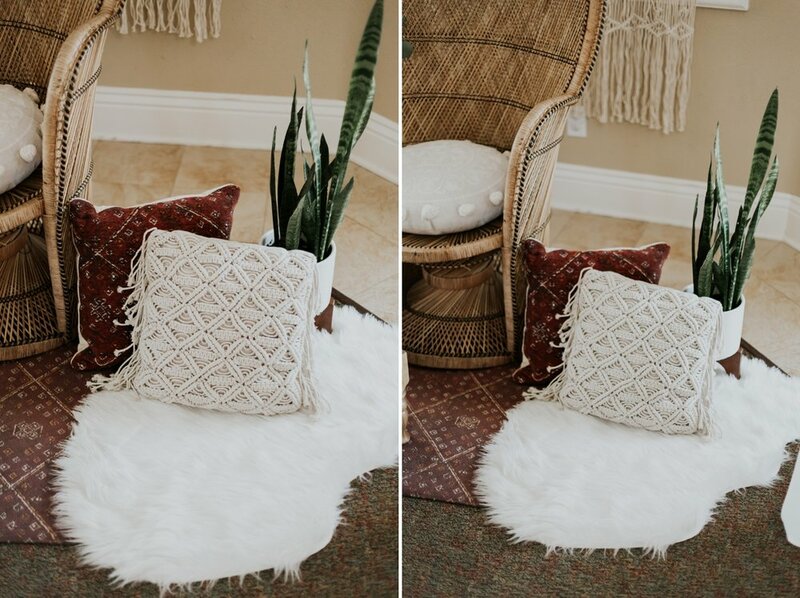 The chair and gift area was also one of my favorites as we brought in a boho peacock chair and macrame curtain as well as some pillows and rugs and plants to really make it a comfy boho vibe. The chair and curtain will be going in Junipers nursery which is so exciting and some special touches were the handmade embroidery hoops on the wall. 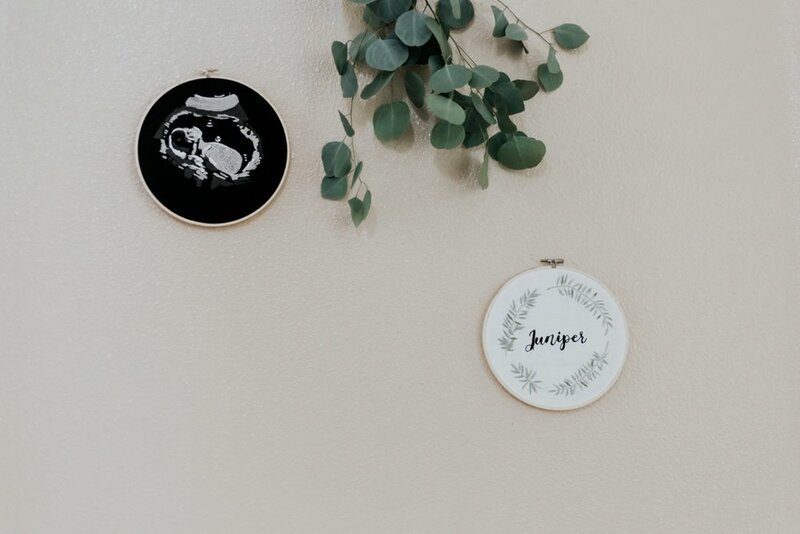 One of them is of Juniper's most recent ultrasound that was hand stitched and the other is Junipers name with juniper leaves around her name. These are little keep sakes that will last a lifetime and it was really meaningful to get to share those at the shower. The dress I chose to wear was also something else that was special. The first time around when I got pregnant with Peyton I was so excited about having a shower in general that right after we found out I had already picked out the dress I wanted, which was this one. I one hundred percent knew I still wanted this specific dress from Filly Boo Maternity and once I received it I cried. 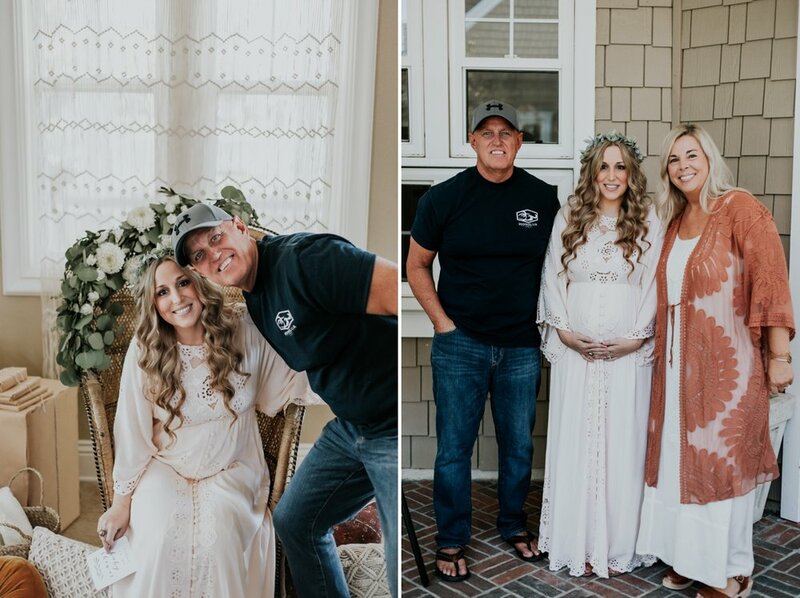 It was one of those things that I had pictured in my mind and it was finally happening in real life, it felt so surreal... so I was of course SO excited to wear it for the shower with my Juni bump. I also paired it with a very important bracelet that my parents had gifted me on christmas last year that had a "P" on it for Peyton, I felt it was fitting that our first babe was represented in some way as we honored Peyton's life and celebrated Juniper. The gift table also held a little gem. 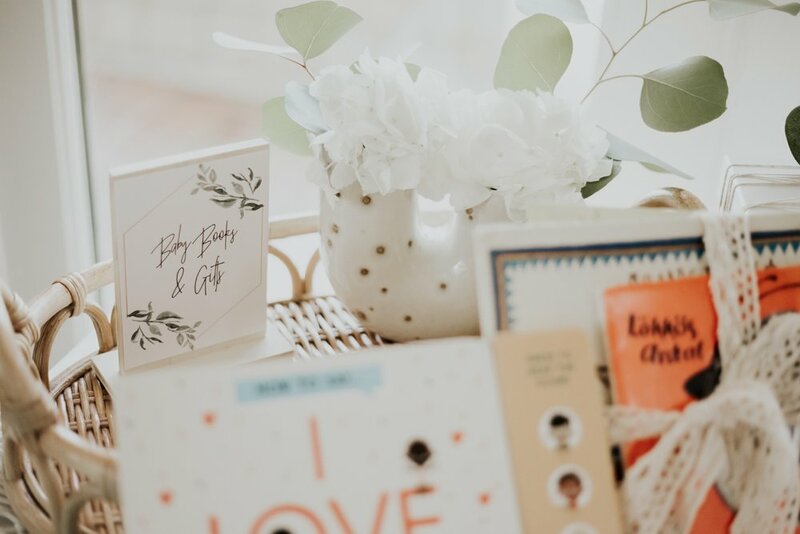 It was decorated simply with a moses basket and some macrame touches along with some flowers and a boho tray basket for cards and baby books, but there was one very intentional set of books. If you notice two books with an orange on on the top those are the ones! My mom had brought along two books that my grandma had read to her when she was little and that I remember her reading to us as well when we were kids. They are old and in Hungarian and remind me of her so much. Not getting to have her there was really hard and emotional and it was very special that my mom brought a little memento to remind us of her and that she was with us in spirit. Now my mom gets to read them to Juniper in Hungarian and that is something I can't even wait for! Each and every family member and friend have played an instrumental role in our lives and mean so much more than we can ever express. God has and continues to grow us in this process and growth has been a huge part of this past year for Dan and I in general. There are so many people in our lives who have played a part in helping us and seeing us through and we are so appreciative of that. 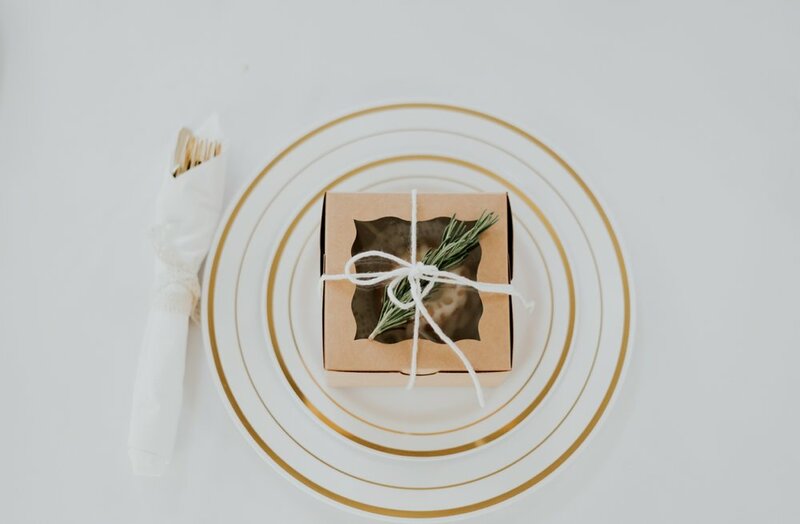 So, I really wanted our favors to represent life and growth as our guests took them home. With the tags "watch baby grow," I thought it was so fitting as God has so graciously sustained our growing babe and has grown our hearts in so many different ways along the way. Our loved ones who have been with us and along side of us on this journey get to continue in that and now have a reminder at home that they have and always will be apart of it. We can't thank everyone enough for those who have loved us, seen us through and who continue to celebrate Juniper's life with us! We can't wait to have her here and meet all of the amazing people who we love dearly because I know she will love each person just as much as we do! Any other questions about where anything else is from feel free to leave a comment and I would be more than happy to get back to you!